I survived my 25+ hour drive from Connecticut to Dallas. The first leg of my journey took me through Pennsylvania and West Virginia. Both were the prettiest states along my whole drive. (pictures to come) Pennsylvania has rolling farms dotted with quaint farm houses and barns. Lush green tree covered mountain bordered the winding highways of West Virginia. I lucked out because most of the highways were largely empty throughout my trip so I avoided traffic even through construction zones which closed down a lane or two. 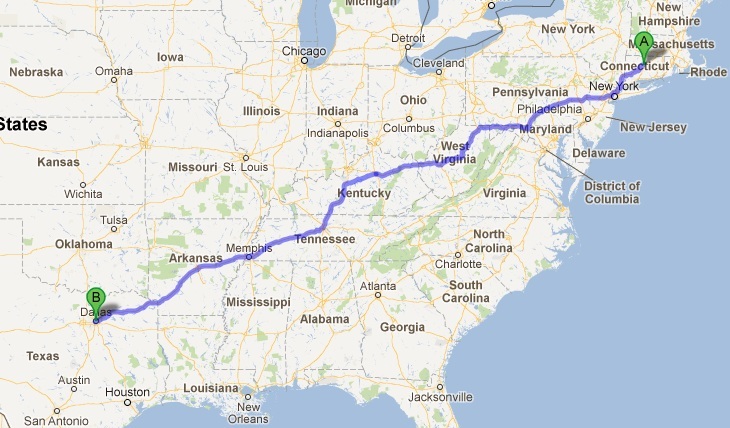 The second leg of took me through Kentucky and Tennessee. Both had rolling hills and large open spaces but failed to maintain the beauty of Pennsylvania. On my third day Arkansas and Texas were just flat plain boring states. Overall I found the driving to be easy especially because most of the time I was one of only a handful of cars on the road. To keep my mind busy I listened to 4 books on tape. The first is Amy Sedaris’s I like You- Entertaining Under the Influence. I’ve owned and listened the audiobook for years and it still makes me laugh as she recounts her wacky entertaining tips. The other three books were new: Andy Cohen’s Most Talkative, Ali Wentworth’s Ali in Wonderland, and Rachel Dratch’s Girl Walks into a Bar. First I’ll start with my favorite of the three, Rachel Dratch’s Girl Walks into a Bar. The book details her start on Saturday Night Live and 30 Rock and then subsequent unemployment as Hollywood only cast her in roles playing older obese lesbians. Much of the book talks about her struggles finding work and love after success and fame have faded away. Her stories made me both laugh and cry. I liked it so much that I started listening to it for a second time when I got sick of Andy Cohen. (I’ll get to him in a minute) I didn’t have high expectations but I give Rachel Dratch a solid thumbs up! You may remember Ali Wentworth as the blond white girl from In Living Color or her later marriage to George Stephanopoulos. I was interested in reading the book because her background was not what I expected. She grew up in an upper class privileged family from Washington DC. Her mother was the social secretary for Nancy Reagan. The book held my interest but I kept thinking how out of touch she seemed. She continually mentioned stated that she was just like anyone else and that her family wasn’t as rich and privileged as everyone thought. These proclamations were paired with stories about live in nannies, going to an elite boarding school and staying at the Four Season’s Hotel whenever she needed refuge. So now I’m finally in Dallas! Actually I’m staying at a hotel in Richardson for a week until my apartment is ready… but I’m close.